DJ Rich B is based in London, England, and runs Enriched Records. A pioneer of the British house music scene, in 2018 he remains a prominent figure in the industry and an in-demand producer and remixer. In the last few years he has officially remixed (with studio partner DJ Phil Marriott), RuPaul & Michelle Visage, Conchita Wurst, LeAnn Rimes, Erasure, Dannii Minogue, Dave Aude & Jessica Sutta, CeCe Peniston, Nile Rodgers, Holly Johnson, Florrie and more, and has topped the US and UK upfront charts three times. As a solo remixer his Enriched Mixes have also been making waves, notably on the US circuit scene, for artists including Toy Armada & DJ GRIND, Joe Gauthreaux, Inaya Day, Abigail, Temporary Hero and the Billboard Dance Chart #1 hit “Lick Me Up” by Tony Moran, Dani Toro and Zhana Royia. With his label Enriched Records, he has also had club hits with Lady Bunny, Marcella Puppini, Levi Kreis, Cool Like Daddy, Chrissy Darling and more. Rich B perfected his trademark uplifting sound through his key DJ residencies in the UK, most notably on the huge main dance floor at the world famous Heaven in London from 1994 to 2001 (The Fruit Machine), the legendary Love Muscle at The Fridge, Sherbet and Crash (all also in London), as well as at Paradise Factory and Essential in Manchester, Luvely in Edinburgh, and on both Gaydio and Gaydar Radio. He has also played regularly for Alternative Holidays and RSVP Vacations, and toured Brazil, South Africa, and the USA. Recent live work includes European Snow Pride, the high profile and popular annual gay ski event in the French Alps. Rich B & Marcella Puppini – What Have You Done To Your Face? Enriched Records storm 2018 with Rich B ft Levi Kreis – “I Can’t Go For That” which is released in collaboration with US Billboard label Swishcraft. 2017 saw single releases from Bitrocka Ft Freedah Soul, and from Chris Brogan Ft Rob Miles, building on the success of Groove Addix ft Lady Bunny “Lately”, Rick Marshall “Fever” and “Enriched Mixes Volumes 1 & 2” in 2016. 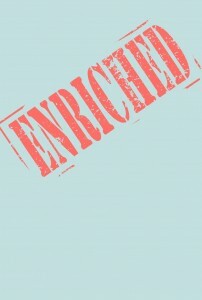 Enriched Records was re-launched in 2012. The first release – Rich B & Marcella Puppini “Revolution” was signed by Toolbox House, remixed by Pagano, Nik Denton, and 7th Heaven, and was one of the biggest club hits of the year. Marcella is a founding member of The Puppini Sisters and has worked with Micheal Buble amongst others. Rich & Marcella have since followed the success of “Revolution” with “Hussy” and “What Have You Done To Your Face?”. Rich B also teamed up with Chicago based Tony Award winner Levi Kreis for “So Much Better” and “Love Revolution” – taking the trademark bouncy Enriched sound Stateside. Further releases include the cover of the disco classic “Strut Your Funky Stuff” by Cool Like Daddy, “Club Freak” with Chrissy Darling, and EPs from club legends Gonzalo Rivas, Jonnyscratch and Da’Silva Gunn. Our compilation albums ENRICHED MIXES Vol.1 & 2, which feature exclusive DJ mixes, are available now from our online store, and all major online digital retailers. Also, whilst I love the idea of having a list of my remixes, the list is incomplete and I think would be better replaced with links to my website, if that is ok.
Jonnyscratch – Back End e.p. Gonzalo Rivas – Passion e.p.